Backed by over 30 years of scientific research and consumer satisfaction. Green Magma® is a juice extract, not a fiber product. Our bodies can more easily and completely absorb the nutrients from a juice supplement than from a fiber, since fiber locks in many of the important nutrients. Dissolve 2 teaspoons into an 8 oz. glass of water or your favourite juice. Recommended twice daily on an empty stomach. Powdered juice from organic young barley grass, organic maltodextrin (a complex carbohydrate), organic brown rice. Certified organic by Quality Assurance International (QAI). Added sugar, salt, colorings or fillers, animal products, gluten, soy, wheat, yeast and non GMO. Magma Plus® contains barley grass juice powder found in Green Magma® plus 56 other natural ingredients for a potent, nutritious energy drink. As with all of Green Food’s products, Magma Plus® contains active enzymes, antioxidants, vitamins, minerals, amino acids, protein, and chlorophyll. Tested pesticide and herbicide free! Magma Plus® is available as a powder (5.3 oz. and 11.0 oz. jars). 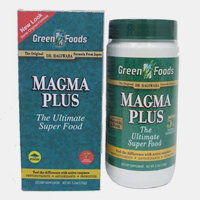 Magma Plus® contains a significant amount of barley grass juice powder (1.8 grams per serving), which gives it the nutritional properties of Green Magma® "plus" the many benefits of the most healthful fruits, vegetables, plants, and herbs. Unlike many stimulants, Magma Plus® is a natural energy booster containing important nutrients required to produce the cellular source of energy, ATP. Dissolve 3 teaspoons into an 8 oz. glass of water or your favorite juice. Recommended twice daily on an empty stomach. Powdered juice from organic young barley grass, mixed vegetables extracts*, select whole foods extracts*, vegetable-derived nutrients*, soy lecithin, bee products*, mixed fruits extracts*, herbal extracts*, green algae*, probiotic cultures*, vitamin E, vegetarian source enzymes*. Chia seeds are well known for the highest source of Omega-3s in the form of alpha-linolenic acid (ALA) for the primary and secondary prevention of heart diseases. One scoop (15g) of Organic Chia daily provides your body with up to 3,000mg of Omega 3's for maximum protection. Vitamin E found in Chia seeds further protects heart functions. It improves lipids profile, thus restoring a helathy blood flow. Omega-3s (most notably ALA) found in Chia seeds improve mobility and agility of joints and connective tissue. These actions benefits the active young and seniors. Omega-3s are important in moderating inflammation as they are biological precursors of eicosanoids (hormones to aid healing). Omega-3s found in Chia seeds are considered anti-inflammatory in nature, thus reducing pain and discomfort. Dry, thick, scaly and allergic skins are results from deficiency of essential fatty acids. These are problems related to production of histamine, prostagladins and inflammation. Essential fatty acids such as Omega-3s play an important role to beautify our skin, hair and nails. Omega-3s form a barrier on our skin against loss of moisture, thus protects us from dehydration. ALA found in Chia Seeds may reduce the risk of transepidermal water loss (TEWL). Packed with a balanced blend of protein, essential fatty acids, fiber, complex, carbohydrates, and antioxidants, Chia seeds are unrivalled among all seeds and grains for providing energy to your mind and body. Benefit athletes, eldery people, overweight and middle aged person. Rich in both soluble and insoluble fiber, Chia seeds aid in digestion and soothes constipation problems. The rich fiber content also benefits people with high cholesterol and glucose level. Soluble fiber plays an important role in regulating cholesterol and glucose level while insoluble fiber prevents constipation by regulating bowel movement and aids in body's digestion. Mix one scoop (15g) into 8oz. of liquid or food 1-3 times a day. Eat them straight from the bottle as a nutritious snack or add to cereals, salads, yoghurt, cottage cheese, soups, sandwiches, or oatmeal. Store with lid tightly closed in a cool, dry and dark place.